Monster Energy NASCAR Cup Series drivers will head to Virginia for short-track racing at Martinsville Speedway this weekend. Prior to Sunday’s STP 500 (2 p.m. ET, FS1) at “The Paperclip,” here’s everything you need to know to get ready for racing at Martinsville. Martinsville is a 0.526-mile paperclip oval that measures the shortest on the Monster Energy NASCAR Cup Series circuit. With a track width of 55 feet, the track also features 800-foot straightaways and tight, nearly flat turns — with just 11 degrees of banking — that fosters close-quarters racing. 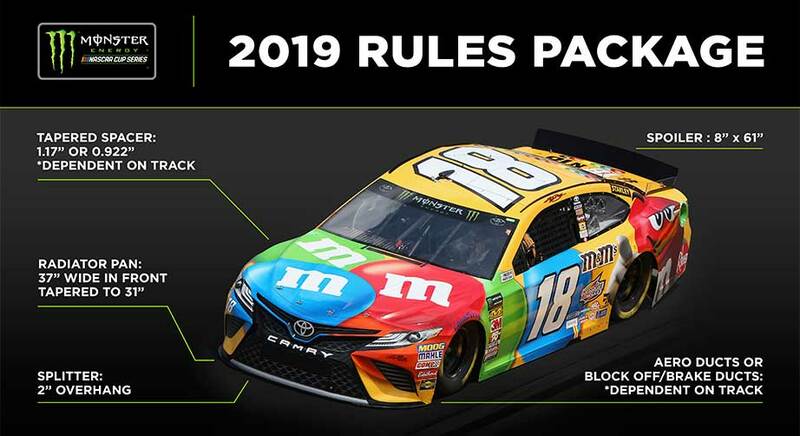 The Monster Energy Series will run the 2019 rules package tailored for short tracks (less than 1.33 miles in length) and road courses. A 1.17-inch tapered spacer will be used, with engines expected to generate about 750 horsepower. Unlike last week’s race at Auto Club Speedway, no aero ducts will be used. This weekend’s configuration of the 2019 rules package will be used at 14 events in total this season. The 1.17-inch tapered spacer was first used this season at 1-mile ISM Raceway on March 10. After winning at ISM Raceway on March 10 and notching his coveted 200th career win at Auto Club Speedway last weekend, Kyle Busch will look to make it three in a row this weekend at Martinsville Speedway in the No. 18 Toyota. Busch has won three straight Cup races twice in his career: First in 2015 (Kentucky, New Hampshire and Indianapolis) and most recently, in 2018 when he won at Texas, Bristol and Richmond. The Joe Gibbs Racing driver’s start to the 2019 season has been impressive; in addition to his two victories, Busch owns an average finish of 2.6, with four of his five races resulting in top-five results. His recent Martinsville numbers are equally impressive; he’s finished in the top five in all of his seven races with crew chief Adam Stevens at the paperclip oval, including two victories in 2016 and 2017. Sunday, March 24 at 2 p.m. ET on FSI, MRN, SiriusXM NASCAR Radio. Nine active Monster Energy Series drivers have earned a victory at the track — Jimmie Johnson (9 wins), Denny Hamlin (5 wins), Kurt Busch (2 wins), Kyle Busch (2 wins), Joey Logano (1 win), Clint Bowyer (1 win), Brad Keselowski (1 win), Kevin Harvick (1 win) and Ryan Newman (1 win).